A Baron von Raschke Kickstarter funding campaign that ends tomorrow already has made its $20,000 goal. 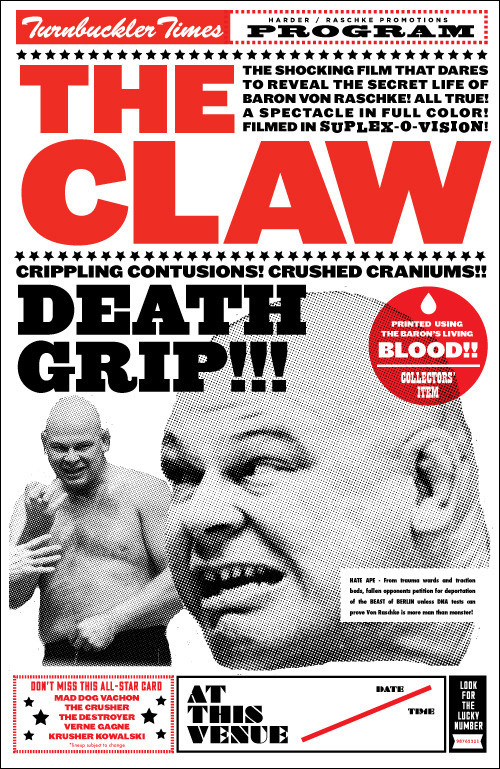 The money will be used for post-production costs of a documentary about legendary pro wrestler Von Raschke, aka "The Claw," directed by Phil Harder. The filmmakers already have spent two years gathering documentary footage from the 1960s and '70s, Raschke's heyday as the Baron. His fearsome German wrestler often attacked opponents with the Brainclaw grip, which was sometimes censored in TV as too violent and disturbing. Photographer Karl Raschke, son of the wrestler, is on board as a producer of the movie. Recreated scenes are mixed with film footage to explore the growth of pro wrestling in this era as well as the mild-mannered Nebraskan, Jim Raschke, who settled in Minnesota and raised a family that includesTwin Cities journalist Heidi Raschke. As of Monday noon, there were 219 backers pledging $27,286 to help fund completion of the movie. The campaign officially closes on Tuesday.